Supports all Delphi versions from Delphi 5 to Delphi 10.2 Tokyo. Smooth scrolling on Android and iOS. Live text styles preview (font family,size, color, baclground). RTF and MS Word DOCX Import on all platforms. PDF export on Windows, Android, OSX and iOS. Embedded Find dialog, Text search, Document Index generation. To start using the editor simply drop a THtmlEditor component on a form and set its HTML:TStrings property or call Editor.HTML.LoadfromFile function in code. THtmlEditor is ready to use and most of it's function are accessible via keyboard (f.e. Ctrl+B for bold). All basic commands are accessible via actions. Place an ActionList on the form and use the New standard action command to add actions from the HtmlEdit group. THtActionPasteImage - paste image from clipboard. THtActionFontBold - set font bold. THtActionFontItalic - set font italic. THtActionFontUnderline - set font underline. THtActionFontStrikeout - set font strikeout. THtActionAlignLeft - set paragraph alignment to left. THtActionAlignRight - set paragraph alignment to right. THtActionAlignCenter - set paragraph alignment to center. THtActionUnorderedList - convert selection to unordered list. THtActionOrderedList - - convert selection to ordered list. THtActionIncreaseIndent - increase block or list indent. THtActionDecreaseIndent - decrease block or list indent. THtActionAddUrl - convert selection to URL (link). THtActionSetHeader- convert current block to header (header level are defined by ActionComponent tag). To control font name and size use THtFontCombo and THtFontSizeCombo components. Just place them on toolbar and set Editor property if there is more than one THtmlEditor component on form. Highligted block element containing caret. To use Addict library enable $DEFINE ADDICT in \VCL\htmlinc.inc before installing the package. Add TAddictSpell component on the form and set THtmlEditor.AddictSpell property. To use another spellchecking library you will need to write handlers for the OnSpellCheck and OnWordCorrection events. 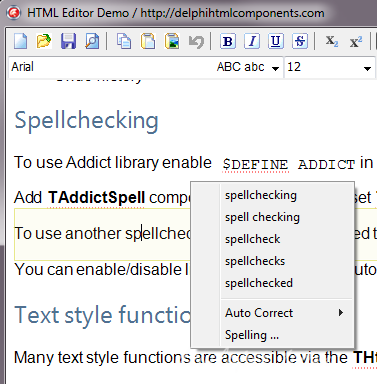 You can enable/disable live spellchecking and autocorrection by using the Spellchecking and WordCorrection properties. THtmlEditor has a deicated property to make it simple to alter the scale of the document. Simply alter THtmlEditor.Scale and the document and its contents will be fully rescaled. For examaple, place TTrackBar on form, set its Position to 100 and Min/Max to 50-200. To use Unicode in old Delphi you should have TntUnicode library installed. Open /VCL/htmlinc.inc file, uncomment $WIDESTRINGS define and recompile library package. Tag navigator component is used to show path to current element (from document root) and highlight block element in document. Simply place it on the form and set its width.